Cristiano Ronaldo vs. Lionel Messi. It’s an argument as old as time itself, with diehard fans of these two all-time greats throwing out stats and facts in support of their preferred candidate to make their case for superiority—Messianiacs pointing to his better scoring record, his better passing, his better dribbling abilities, his ability to dominate games in many different ways, and his bigger trophy haul as evidence of the Argentine’s eminence; the Ronaldonians indicating their man’s ability to jump real high and head the ball real good as proof of the Portuguese’s peerlessness—in a rabid and unending struggle to make the definitive case that one is better than the other. The answer was right there before our eyes the whole time, only we were too blinded by Messi’s flashy but ultimately meaningless talent to see. 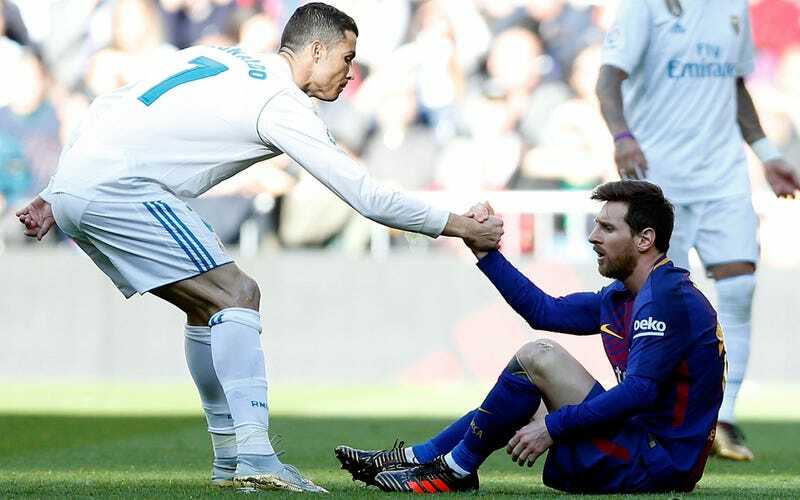 Next time a Messi stan reels off his goals and assists numbers or waxes lyrical about his mastery of the ball or cues up clips of his clutch late-game heroics, Ronaldo fans will finally have the ultimate trump card in the form of these images of Ronaldo clapping his hands a couple times. If that’s not proof of greatness, I don’t know what is. Very Short Debate: Is Lionel Messi Still The World&apos;s Best Player?